Nearly a half-century ago, President Richard Nixon's secretary of state, Henry Kissinger, established a successful U.S. strategy for dealing with America's two most dangerous rivals. He sought closer ties to both the Soviet Union, with its more than 7,000 nuclear weapons, and Communist China, with the world's largest population. The idea was similar to British and French policy in the mid-1930s of discouraging Adolf Hitler's Third Reich from becoming the partner of Josef Stalin's equally powerful and dangerous Soviet Union. Unfortunately, that effort failed, and Nazi-Soviet cooperation led to their joint invasion of Poland in 1939 and the outbreak of World War II. 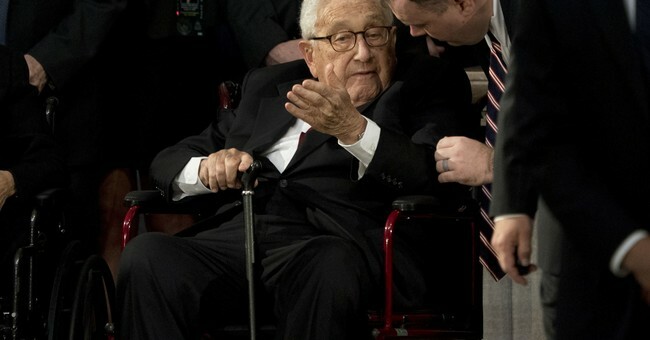 We forgot Kissinger's wisdom during the Obama administration's coddling of China and the schizophrenic Russian "reset." The reset was initially a disastrous appeasement of Russian conventional and cyber aggressions. Its failure soon led to an about-face demonization of Russian President Vladimir Putin as an anti-democratic authoritarian -- as if he had been, or would ever be, anything other than a tyrant. From 2009 to 2017, U.S. leadership rationalized that China would soon not just be an Asian and Pacific superpower, but eventually would eclipse America itself -- as if its eventual supremacy was destiny rather than being due to U.S. indifference. What followed was systematic and unchecked Chinese commercial and intellectual-property cheating. Beijing stole U.S. technology, ran up huge trade surpluses and warped the entire world trading system. Such one-sided Chinese mercantilism was excused as "free trade." China's military aggression in the South China Sea was also winked at by Washington. So the Chinese built artificial bases in the Spratly Islands to bully their neighbors and to manipulate Pacific trade routes. America may be the strongest economic and military power in the world, but it had violated every one of Kissinger's principles. Russia and China both agreed that the willpower of the U.S. was weak, and despite their own existential differences, they found it mutually profitable to collude in reducing American stature. For all the specious charges of Russian "collusion," Trump has boxed in Putin with economic sanctions and military aid to Ukraine. He has beefed up defense spending, demanded greater NATO readiness and accelerated U.S. oil production -- but doing so while also reaching out rhetorically to Putin. China is worried. Trump's domestic opponents may write him off as a crude buffoon, but Beijing fears that he is a crafty Machiavelli or Sun Tzu, already downsizing Chinese power. China's stock market is way down. Its economy is slowing and its currency declining. Average Chinese citizens wonder why, in tough times, their leaders are lavishing foreign aid on African countries and other Asian nations while China is mired in a trade war with the U.S.
Russia certainly has no interest in seeing in its neighborhood a nuclear Iran or an unhinged nuclear North Korea -- or having disputes with a Chinese colossus along its 2,600-mile shared border.